Here at SD Bullion, every month we update our US Mint bullion coin sales page with the latest precious metal coin sales figures. 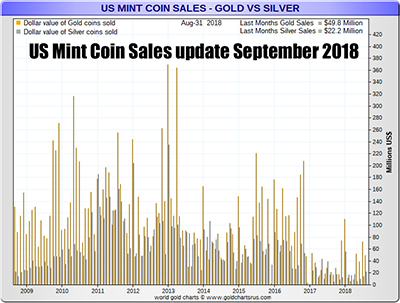 In this specific post, we will dive into US Mint coin sales updated to September 2018, while also posting the latest US Mint bullion coin price premiums charts. For the month of August 2018, both Silver and Gold Eagle coin sales and product price premiums were up. Have a look below. For the month of August 2018, the US Mint sold just under $50 milion USD in American Gold Eagle coins, and just over $22 million USD in American Silver Eagle coins for the month. For the month of August 2018, the US Mint sold 41,500 oz in American Gold Eagle coins. 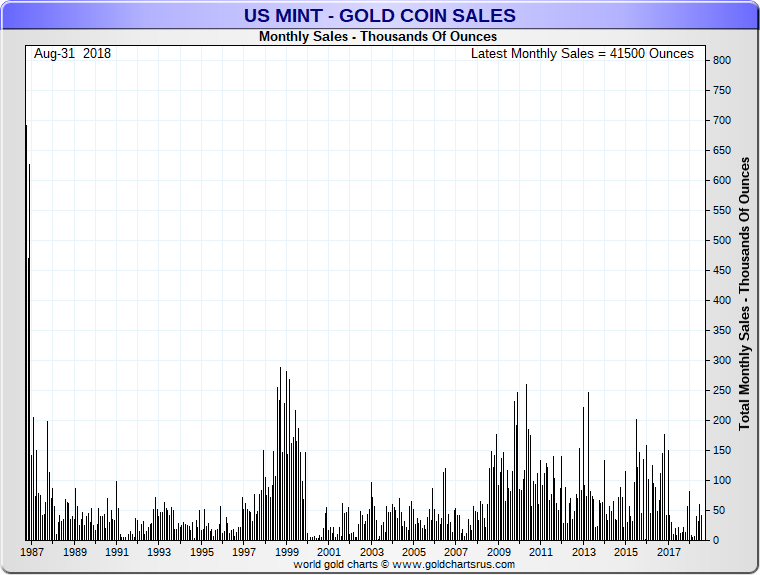 These lower gold coin sales volumes are on par with pre-2008 financial crisis levels. It is unlikely US Mint gold coin sales will not revert to prior year averages ( 2009 - 2016) without either much lower gold spot prices and or a recession and lowering of valuations in other financial markets (e.g. US dollar values, stock price valuations, bond markets, real estate, etc.). With the recent dip in gold prices, the physical bullion industry has mostly sold off its secondary (sold back) inventories. 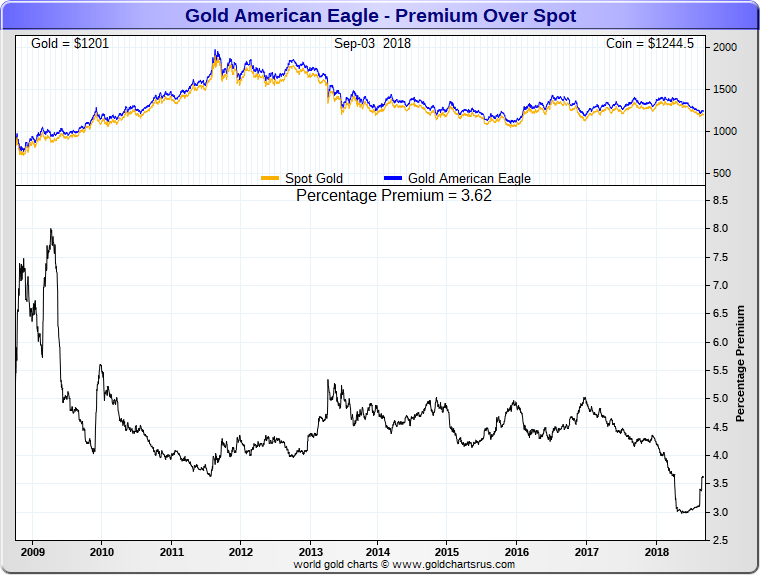 Thus recent record low American Gold Eagle coin premiums may have seen their lowest levels for the time being. As you can likely see in the chart above, American Gold Eagle coin premiums or their prices above the live gold spot price have risen to just over 3.5% wholesale. Retail prices above gold spot prices will typically be a little higher than that level. For the month of August 2018, the US Mint sold 1,530,000 oz in American Silver Eagle coins. 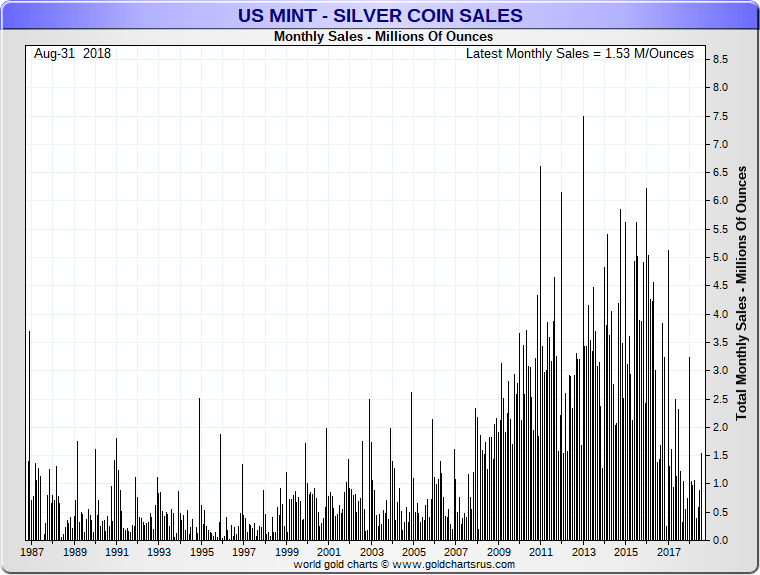 These lower silver coin sales volumes are on par with higher pre-2008 financial crisis levels. 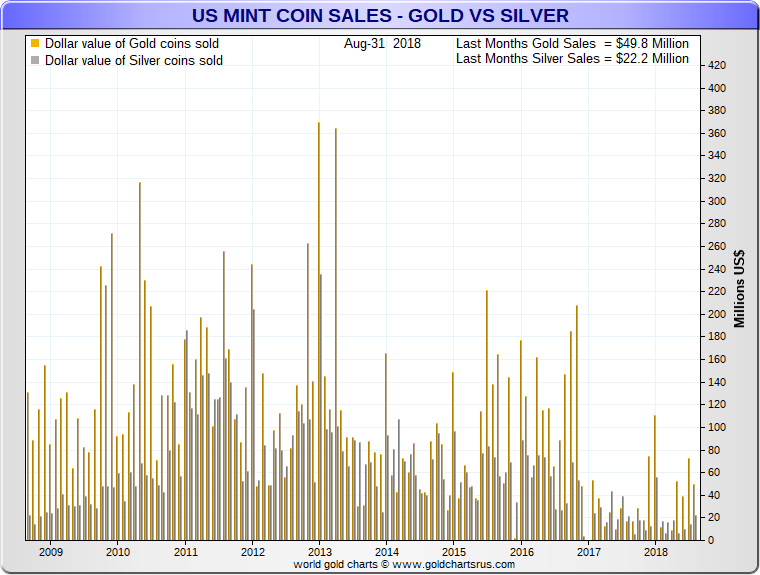 It is unlikely US Mint silver coin sales will not revert to prior year averages ( 2009 - 2016) without either much lower gold spot prices and or a recession and lowering of valuations in other financial markets (e.g. US dollar values, stock price valuations, bond markets, real estate, etc.). With the recent dip in silver prices, the physical bullion industry has mostly sold off its secondary (sold back) inventories. 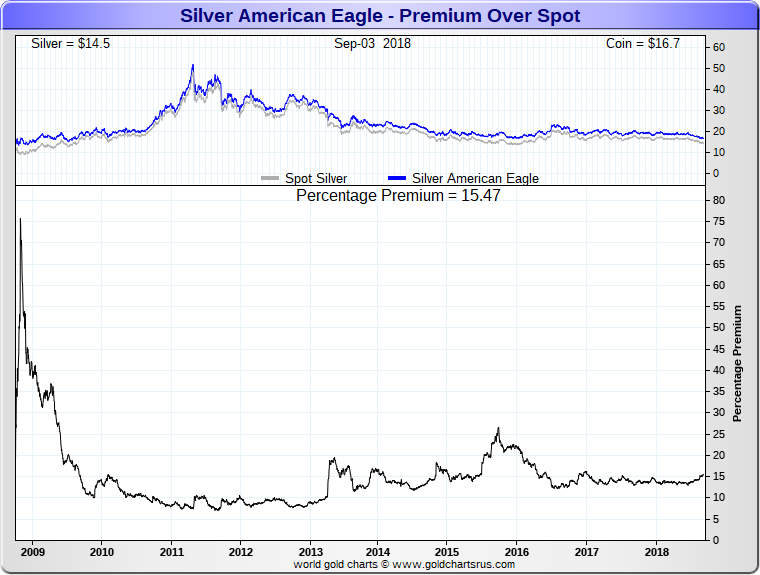 Thus recent low American Silver Eagle coin premiums may have seen their lowest levels for the time being. As you can likely see in the chart above, American Silver Eagle coin premiums or their prices above the live silver spot price have risen to just over 15.17% wholesale or about $2.20 oz over silver spot prices per 1 oz silver bullion coin. Retail prices above silver spot prices will typically be a little higher than that level when buying smaller portions of US Mint Silver Eagle coins. For further insights into current and past physical bullion market supply demand dynamics, below is one of our recent Metals & Markets podcast interviews with one of the largest bullion product market makers in the world.